In New Hope Valley, North Carolina, there are a group of dedicated volunteers whose passion is to share their love of trains with our community. How fortunate for us who live in the Triangle Area to be able to share in their zeal. 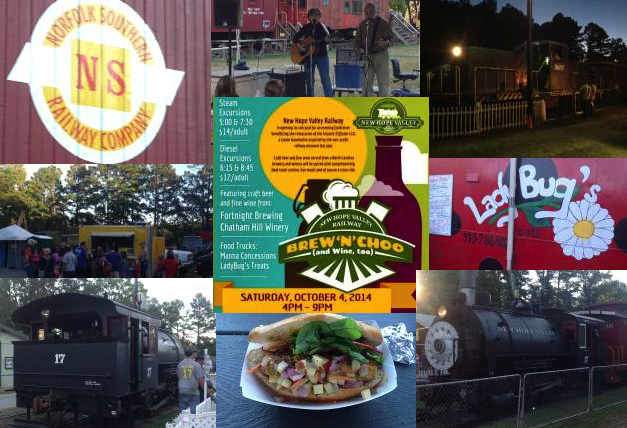 Triangle Street Eats recently attended their first fundraiser, Brew-n-choo. It would make perfect sense that a dedicated group of people, sharing their love of trains, would exist in the Triangle Area. Anyone who is curious about early forms of transportation/commerce, as well as inquisitive about early engineering accomplishments would appreciate the contribution that railroad systems has made in our nation’s history. It is difficult to put a dollar value on how much rail commerce contributes to our GNP, or how many miles there are of track, but I assure you, it is significant. By this same logic, people sharing a passion for full-scale trains as a way of educating and enlightening others about the contribution trains have had on our nation, would be so dedicated. New Hope Valley’s train club, The Triangle’s Train, held this fundraiser this past Saturday, to help offset operation costs, as well as help restoration of ‘Old # 10’, their most ambitious project to date. It is interesting to note that this was their first such event ever. The Belle and I purchased tickets to ride on their train car on-line. We chose to ride with Locomotive 110, an oil-fired steam locomotive. We arrived about 5:30 pm, even though our departure time wasn’t until 7:30. I was surprised to see how picturesque the location was, as well as how well attended the event was. Beer, wine and food venders were available to visitors from; Fortnight Brewing Company, Chatham Hill Winery, Manna Concessions and LadyBug’s Treats. India Cain and Keith Allen also provided Blue Grass music. The atmosphere was family friendly with lots of curious children playing and enthusiastically engaged in the history of trains. Our train departed after dark, and took us along a wooded path that was illuminated only by the light of a waxing moon. The sound of the train’s steam whistle, slicing through the cool Autumn night, add a haunting element to the hour-long ride. There are several more events scheduled this year. The first will be the Halloween Express, Saturday October 18, from 4:00 – 7:45 pm, then again on Saturday October 25, 4:00 – 7:45 pm. A Christmas themed event is also available in December, which will include Santa Clause. All tickets are available on-line. Please take time, and your children, to ride the rails of days-gone-by. You won’t regret it. Stay Hungry …for knowledge my friends! Bad Boy.